Most people nowadays don’t want to read a wall of text or watch a long video, and this is where Instagram comes in. Photographs and short 1 minute videos are an easy and efficient way to communicate with people. Download the Instagram app on your mobile device. Photos can only be uploaded via a smartphone unless you subscribe with an external service. Take photos or a short video (max. 1 minute) using your phone’s camera or transfer the data to your phone. Upload the photo/video using the app. You can add filters to your images. If you double tap on a filter, you can adjust its intensity. You can combine multiple images into a single square photo, or upload multiple photos in a single post. If you do the latter, only the 1st post will show up as a preview. 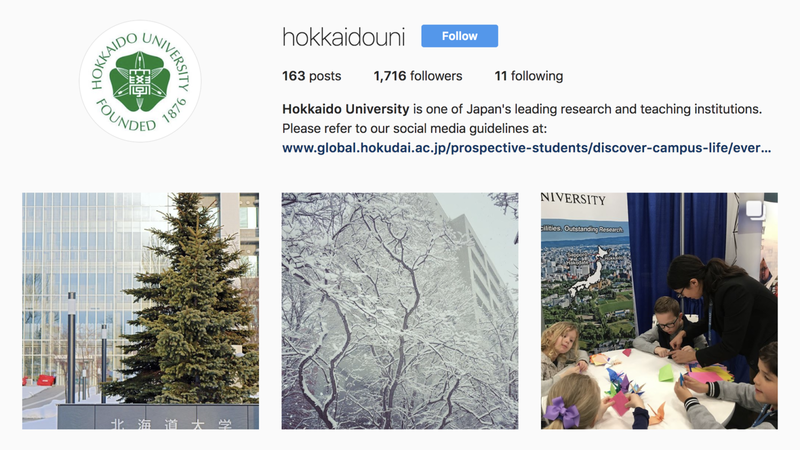 Utilize many hashtags (like #hokkaidouniversity) to boost the chance of your photo being viewed! 5-15 hashtags are normally used per upload. Tag users (e.g. @hokkaidouni) if you would like to ensure that account receives notification of the post. Connect to Facebook if you would like to share your Instagram photo/video to your personal or business Facebook page. This can be done either through your Facebook settings or Instagram settings. We do not recommend setting up auto-sharing to Twitter since the image preview does not always function properly. By default, photos are uploaded as squares. Please keep this in mind when planning a shot. The higher the image quality the better.